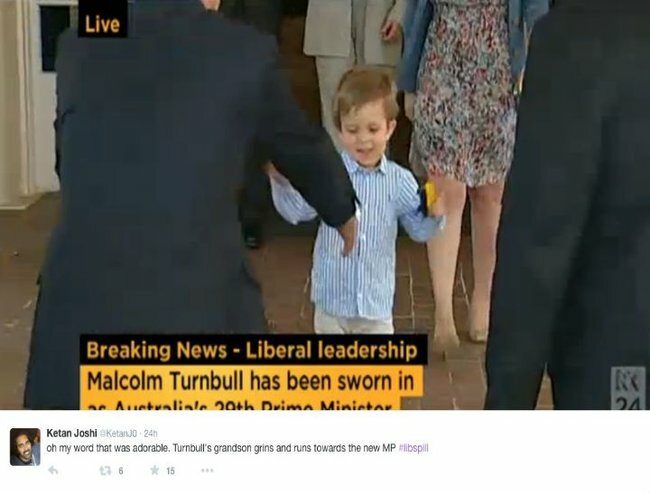 The grandson of the PM stole the show at his swearing in. Why we need more "Jacks" in politics. He’s been already called Australia’s Prince George. Just days away from his second birthday, a ruffle-haired toddler named Jack has created quite a few headlines across the nation. 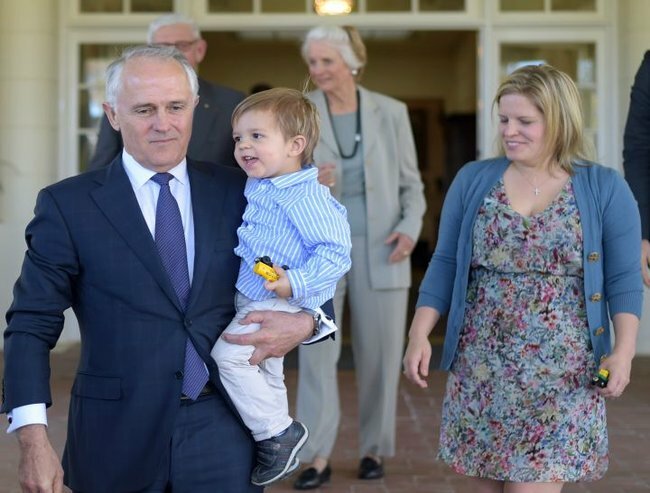 He made his first appearance at an important ceremony for his “Baba”, or as we know him, the 29th Prime Minister Malcolm Turnbull. His ructions caused a few worn-out-by-the-political-machinations-of-the-past-few-days souls to smile again when he ran to embrace the new PM just moments after Baba was anointed to the top job. Bugger off nay-sayers. He’s adorable. The sight and sounds of the little boy, Jack Turnbull-Brown – the only grandchild of Malcolm and Lucy Turnbull – was a refreshing change from the past few days of deposing and sniping. He was real and raw and delicious. Some went as far as to say, freaking adorable. But not all were as pleased. Today some commentators are unhappy at his presence at the Prime Minister’s swearing-in saying it was an “indulgence” and that he took from the “dignity of the occasion”. His sweet little duh duh dah-ing while the Prime Minister was reciting the words that have been recited oh so many times lately was thought to have overshadowed the important event. His dapper little sneaker-ed feet undermining the dignity of the surrounds. His weer-ing and nnnnnn-ing a disturbance. Sure, some of these commentators are just the usual naysayers and dinosaurs we should simply just ignore, but some of them were sadly re-inforcing a stereotype that we hope belongs in the history books (alongside certain deposed Prime Ministers): the attitude that children have no place in politics or business – that family life should remain clearly delineated from working life. You know, the same attitude taken by folk who believe women should be at home caring for our future generations, the same attitudes that create a gender imbalance in pay, in politics, in life. Here’s a thought – while we are making a clean sweep of used-by leaders and starting afresh perhaps its time this attitude was negated as well. 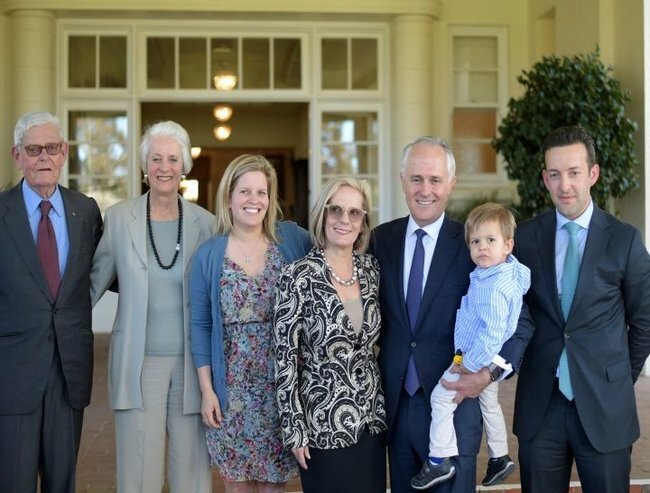 Prime Minister Malcolm Turnbull and his family after the swearing-in. Perhaps our new leader Malcolm Turnbull who has, in the past, described himself as a natural egalitarian can be the one to step up and lead the way in this. In his maiden speech Mr Turnbull alliterated a view we hope we still holds. He said that “children are a social good” that they are “not merely a private optional pleasure”. It’s a short bow to draw that to make family balance a priority, families must be included in public life – normalised as part of public life. Children will coo and gurgle and run about excitedly when their “Baba” is made Prime Minister. Babies will cry and scream and want to be fed when they are hungry. Women – and men will need flexibility in working conditions and equality in pay in order to make their working lives successful. Hear for yourself the sounds of Jack Turnbull-Brown singing “Peg + Cat” ( Post continues after video). With parliament seeing a mini baby boom this year from Kate Ellis, Penny Wong, Amanda Rishworth and Kelly O Dwyer lets hope that we see more families becoming a part of politics. And as Kelly O Dwyer pointed out only today – when she was told to express rather than breastfeed in parliament – the machine needs to learn to adjust. It’s been a tradition in political life to try and keep your family out of the public arena, and of course they are entitled to their privacy, but when they allow us a glimpse into their lives we shouldn’t condemn it – we should celebrate it. Seeing a plethora of Jacks at events like this wouldn’t be a distraction. It’s a win. Those messy bits of life need to be seen. If we are to make politics at all more like “us” and less of a stark division between those folk in Canberra and the rest of us, then we need more moments like Jack. They are too few and far between. Our politicians are sanitised, cliché-driven, neatly-dressed caricatures.They lack life and empathy. They give us nothing to relate to. If there is one thing that our new Prime Minister can take from the attention over Jack let it be a positive one – let him know that we want more reality back in politics. What did you think of the presence of the Prime Minister’s grandson at his swearing in?